George John Beto was born in Montana, on January 19, 1916, raised in Illinois, and attended Concordia College, a Lutheran boys’ boarding school in Milwaukee, Wisconsin. After completing a six-year college-preparatory curriculum in five years, Beto continued his studies, receiving his Bachelor of Arts degree at Valparaiso University in Indiana (1937) and completing theological studies in 1939 at Concordia Seminary in St. Louis. The school awarded him a doctor of divinity degree in 1989. From 1939 until 1949 he taught history at Concordia Lutheran College in Austin, Texas. 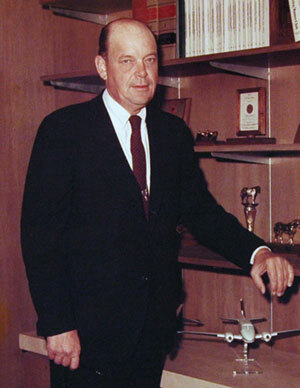 From January 1949 to June 1959, he served as the college’s president. Beto was ordained a minister of the Lutheran Church (Missouri Synod) at St. Paul’s Church in Austin in 1944 and served for a time as the congregation’s assistant pastor. Also in 1944 he earned a Master of Arts degree in medieval history from the University of Texas. In 1955, he completed a Ph.D. in educational administration at UT. Beto began a lengthy involvement with criminal justice when he was appointed to the Texas Prison Board in 1953. He played a crucial role in the establishment of perhaps the first General Education Development testing program for prisoners in the nation in 1956. In 1959, he became president of Concordia Theological Seminary at Springfield, Illinois and remained in that position until 1962. Beto secured legislative appropriations for the prison system and persuaded the legislature and governor to enact a state’s-use law, which required state government agencies to purchase manufactured goods from the state’s prisons. That law resulted in a tremendous expansion of industrial activity and employment and training for prisoners; the sale of prison-manufactured goods increased from less than $600,000 in 1964 to more than $6 million annually by 1972. In 1969, at Beto’s instigation, the Texas legislature authorized a non-geographical public school district for inmates housed at all prison units. Financed by the state’s Foundation School Program Fund, the Windham School District was possibly the first educational system of its kind established at any state prison in the nation. Beto also expanded college-education programs at prison facilities and cooperated with Sam Houston State University to develop a criminology program for research and the training of prison employees and others interested in pursuing criminal justice careers. He served as a professor of criminology and corrections at Sam Houston State University from 1972 until 1991. Beto was a member of the Texas Constitutional Revision Commission, 1973-74, and a member of the Texas Youth Commission board, 1975-78. Beto received a Distinguished Alumnus award from the University of Texas in 1971; the state of Texas opened two prison units in Anderson County in 1980 and 1981 and named them for him.